If your looking for the ultimate power gain and efficiency upgrade on your Nissan GT-R R35 then this Alpha Induction Kit is for you! By changing to a blow-through style MAF, AMS have eliminated the problems associated with running big power on a factory pull-through system. Smoother drivability and a higher peak HP threshold (when used with our ALPHA MAF sensors) can be achieved while still using a 3” pipe. This blow-through conversion allows for much better measurement of the airflow that is actually entering the engine and allows you to run a BOV that will vent to atmosphere without the consequences of a standard MAF. By increasing the size of the upper intercooler pipe on the GT-R from 60mm to 76mm (3") this AMS Intake system allows for more airflow resulting in the greatest increase in HP and torque. Each pipe is powder coated in wrinkle black for good looks, durability and heat resistance. Cooler air makes more power, there is nothing new about that. Cold air contains more oxygen molecules with creates a stronger explosion inside the combustion chamber. 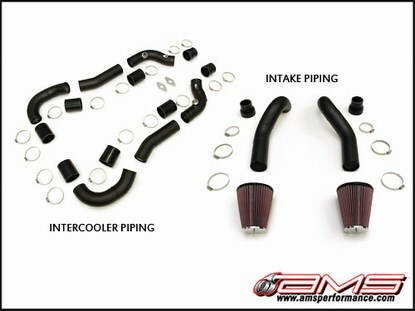 AMS designed their Alpha Intake Piping to pull the coolest air into your engine for the best power gains possible. AMS took a new approach on accommodating different BOV's, making it easier than ever to swap them out. Instead of the traditional welding on of the appropriate flange we incorporated a threaded boss that you can screw on a flange for either a stock, HKS or TiAL valve. Now there is no need to cut off and weld on flanges, only bolt on a new BOV.